Those of us who prefer sleeping on the side have a tough choice to make – either put up with unwieldy traditional pillows that offer questionable support but feel alright to sleep on, or go with thin memory foam ones because decent models that keep the side sleeper in mind are hard to come by. Good pillows for side sleepers are a rare find, so rounding up five of them in one place truly is a rare treat. You snooze – you win could be said about each of them, but which memory pillow takes the prize? Find out below! If you’re suffering from neck problems that aren’t as mild as simple soreness in the morning, you need a firm pillow to sleep on. 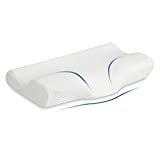 Jiaao’s pillow bridges the gap between regular memory foam and full-on orthopedic models by offering firm support in a thick, traditional-looking package that will nevertheless give much-needed relief. You’ll definitely feel the foam gently envelop the side of your face, but it will never start to sag and jeopardize your neck’s position, even after months of nightly use. It is accompanied by two covers, each of which enhancing the pillow’s properties even further. The outer cover will keep dust and flaked skin from building up inside the pillow, leaving it both healthier and functional for longer. Meanwhile the inner one keeps its interior safe from moisture, allowing you to air the pillow out less frequently. Since it is one of the firmest pillows on the market it’s no surprise that some will find it too rigid to rest on. Furthermore it was designed specifically with side sleeping in mind, so it is much too high for back sleepers and may get rough for restless sleepers that toss and turn a lot. Jiaao’s pillow may offer supreme performance for side sleeping alone, but is somewhat rigid when it comes to other sleeping styles and firmness preferences. Langria offers us a safer, more balanced model with the potential to appeal to many people while still giving side sleepers the preferential treatment. This is a contoured pillow with two lofts, catering to side and back sleepers alike. The higher loft measures 4.5 inches in height and gives ample relief to the overstressed neck in a side sleeping position. Should you decide to lay on your back, adjusting the pillow is as simple as turning the smaller loft towards you. The foam is noticeably softer than that of Jiaao’s model, but this doesn’t mean its quality is lower. Rather, people who don’t like rock-hard pillows will find it enjoyable to sleep on without having the proper support of their neck compromised in either position. As this pillow is CertiPUR-US compliant, the eco-friendliness of its make is assured. 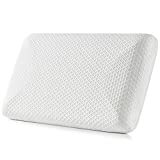 Equally important are the breathability and moisture-wicking properties of both the pillow and its knitted case. These make sure that your sleeping experience is as cool and dry as it is supportive. While the pillow itself is almost flawless, there’s a real chance you can get a model that’s damaged due to the way in which it is packaged. Contact Langria directly if this happens to you and they’ll happily send a replacement. Even side sleepers may find that their pillow is too high, especially if they’re of a smaller build. As going for the lower loft isn’t a good solution either, the best alternative is to give the user control of the pillow’s thickness. That’s where ComfoLife’s shredded foam pillow comes in. The beauty of stuffing your pillow with memory foam that’s been chopped up into smaller pieces is that you get to take some of it out if you feel that the pillow is too high, without losing out on its conformity. This lends itself well not only to people who are struggling to find a correct height to support their side sleeping habit, but to those who like the pillow’s traditional look and don’t want to spend more money on a new one if they decide that sleeping on their back is something worth trying. The pillow has a clever companion – a bamboo fiber cover. This machine-washable protective layer is famous for its heat redistribution properties and the way in which sweat and moisture slides right off, leaving nothing but a cool, comfortable surface for you to sleep on. The hardness of this pillow is much closer to Jiaao’s than Langria’s, meaning that there will be people who take issue with it. 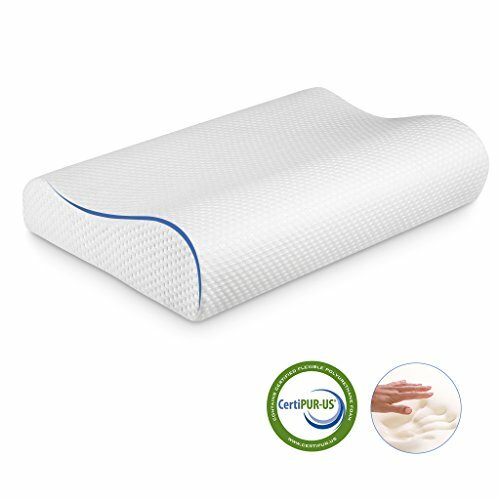 A more serious potential problem arises if you consider the nature of being able to freely take its foam out though – if you remove too much, the cover may not remain firm enough to hold its contents uniformly, leading to lumpiness you’d definitely want to avoid in a memory foam pillow. YOU ARE UNIQUE! WE TOOK CARE OF YOUR PERSONAL COMFORT - The ComfoLife Pillow is fully Adjustable and Customizable! The Pillow comes a well filled and provides perfect support for side slippers. However, if you are a stomach or back sleeper or if you feel the pillow is too high, thick or firm for your comfort, just open the inner zipper and remove some of the foam to get the right height for your personal needs. That's the magic of Shredded Memory Foam! KEEPS YOU COOL TROUGH A WONDERFUL NIGHT'S REST -The Chopped up Memory Foam allows far more air circulation compared to standard memory foam, sensitive to body temperature and has heat dissipating properties. 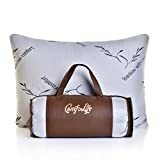 ComfoLife Pillow comes with removable and machine washable zipper cover made from polyester which feels cool to the touch and from Bamboo - one of the softest fabrics in the world, similar to cashmere or silk. NOTE: Only wash the Bamboo cover! Memory foam is not washable! WE'VE PREPARED A NICE FREE BONUS FOR YOU! To make you feel welcomed we are offering for FREE this amazing eBook "SLEEP LIKE A PRO"! It's time to get moving toward a much higher quality of sleep and success in your life! HAPPINESS GUARANTEED: Additionally, we are sure that our Pillow will help you enjoy a good night's sleep. We ensure 100% Satisfaction and are offering a 30-days return policy. Order NOW to avail this promotional prize as it's applicable for a limited time only! How do you combat the loss of form users of ComfoLife’s pillow might experience while still retaining the interesting approach to manual pillow adjustment? Sable’s got the right idea – infuse the cover itself with some memory foam to ensure form retention even with a lot less actual foam inside. We’ve got to give credit to whoever came up with this brilliantly simple design! 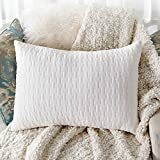 Instead of relying solely on the pillow’s stuffing, 60 percent of the cover itself is made from memory foam, the rest being non-toxic materials like rayon and polyester. Even if you somehow happen to misplace a large portion of the stuffing, there’s still going to be enough in there to hold your head in a supporting way. 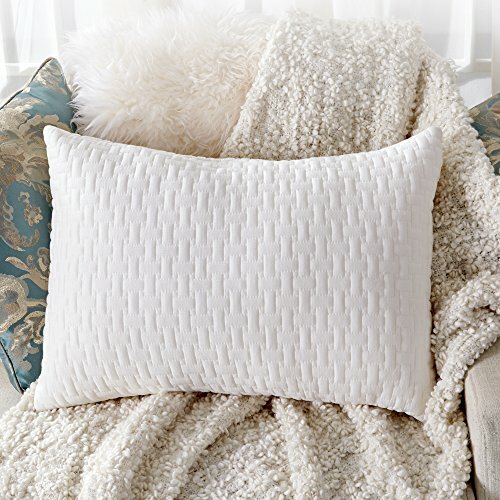 When fluffed up to its fullest, Sable’s pillow is just the right thing for side sleepers used to old-fashioned pillow designs. 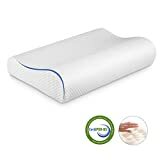 Play around with the amount of foam inside of it and you can bring it down to a level back sleepers will find both comfortable and therapeutic as well. The machine-washable part refers only to the outer casing though, meaning you have to take all of the foam bits out from the pillow before washing. Since there’s no inner bag you could scoop these up in and store, doing this will mostly likely result in a messy and unpleasant experience. On top of that, the foam has a noticeable smell which takes ages to completely air out, so if you’re sensitive to odors this may put you off. Clever ideas seem to abound in the memory foam pillow world, and we’ve saved one of the best for last. The engineers over at Langria have a special place in their hearts for people who just can’t decide between side and back sleeping. They also seem to have enough of snoring and have made an effort to bring you a pillow which ensures your night will be as quiet as it is comfortable. A rare breed indeed, this hybrid pillow sports a central slanting cavity designed to offer support to the head while resting on one’s back. What’s more, sleeping on it provides even pressure distribution while relaxing various neck and head muscles. The result isn’t only deeper rest, but a lot less snoring to boot. To sleep on the side, you simply have to move your head onto one of the pillow’s sides that bulge out into an adequately-sized loft. It can’t get much more intuitive than that! Imagine how relaxed you can be in the morning even if you don’t tend to stay in one position for too long since you have optimum support at your disposal without turning the pillow over or fiddling with its contents. About the only flaw we can pin on this pillow are its size constraints. It would have been perfect had Langria offered it in a few varying sizes. As it stands now though, you’ll fare just fine if you’re of an average build. Broad-shouldered and overall bigger people may find it difficult to sleep on the side properly as the narrow lofts don’t leave much wiggle room to work with. NOTICE: new foam products often have a natural, non-harmful scent; please air the cervical pillow upon unpacking; wait for 24 hours until it resumes its original shape after unpacked; all dimensions are measured manually with a possible deviation of 1-3 cm. If you have any questions, please contact us at langriaservice@gmail.com. Your satisfaction is our motivation. As the fine pillows in this review demonstrate, there are indeed worthwhile options out there for side sleepers to consider. 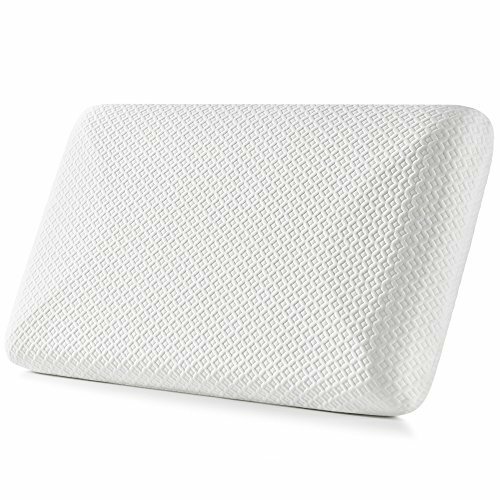 We’ve chosen Jiaao’s hypoallergenic pillow as the winner because of its superb side sleeping support, but none of the other four entries trail behind so there’s no need to feel like you’re missing out if firm isn’t your thing.